Health inequalities are preventable and unfair differences in health status between groups, populations or individuals. They exist because of unequal distributions of social, environmental and economic conditions within societies, which determine the risk of people getting ill, their ability to prevent sickness, or opportunities to have access to the right treatments. These conditions are called the social determinants of health. Many models exist that show how these determinants are interlinked and how many of these factors lie beyond the direct influence of health care. One of the most known models is the Rainbow Model by Dahlgren and Whitehead, which is shown below. Health inequalities are often observed along a social gradient: “a stepwise or linear decrease in health that comes with decreasing social position” (Marmot, 2004). This gradient exists in all countries, either rich or poor, and the pattern can observed when looking at factors such as income, level of education, geographic region, gender, or ethnicity. This means that the more favourable your circumstances are, the better your chances of enjoying good health and a longer life. An example of such an existing gradient can be found below. 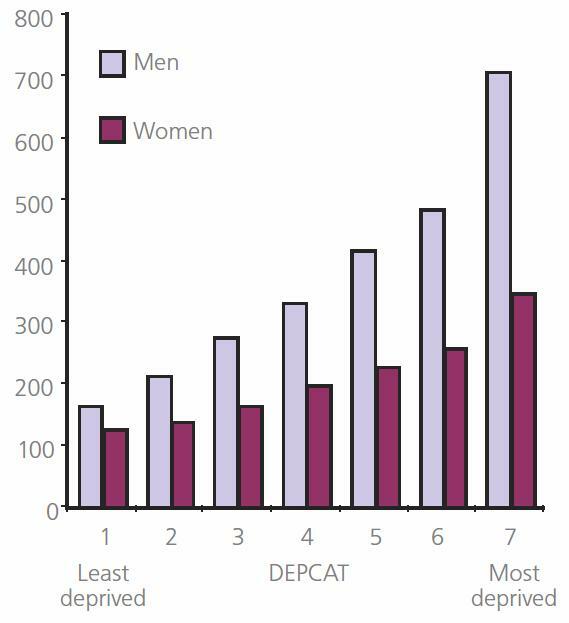 This graph shows the death rate (all causes) per 100.000 inhabitants in Scotland, and the numbers are divided by gender and level of deprivation of the area people live in. Health inequalities persist globally, in the European Union, and between and within countries. They are not a matter of chance but are strongly influenced by the actions of individuals, communities, stakeholders and governments. Action to reduce health inequalities thus means taking a holistic approach, going beyond the health sector, and tackling those factors that can be dealt with through public policy.